In order to put into perspective what the Flames accomplished Monday night, you need a primer on Chicago Blackhawks history. The Hawks played their first NHL game 83 years ago. The Great Depression still was nearly three years away. Bobby Hull wouldn't be born for more than a dozen more years. So it was no small feat for the Flames to carve a small, unwanted niche in Blackhawks lore. They bolted to a 5-0 lead in the first period and then frittered it away, ultimately losing 6-5 in overtime. Never before in all their years had the Blackhawks rallied to win after falling behind 5-0. And first-year Flames coach Brent Sutter was not amused. "If there's one wake-up call, this is it," Sutter told the Calgary Sun. "It's stuff that we've talked about. It's stuff we've gone through. It's stuff we've shown them. It might only be six games into the season, but maybe it'll be a blessing. "I don't mean it in a positive right now because it's brutal to lose like that, but if there's something that should wake them up and they should be embarrassed about, this is it." The Flames continue to give up too many shots and to sit back when they should be putting opponents away. "We've been an erratic team in games," Sutter told the Sun. "We play some good minutes, some bad minutes, some good periods, some bad periods. It's not about physicality. They're all very well-conditioned professional athletes, so when it's not that, what is it? It's pretty easy to identify. "It is a caring group that needs to learn how to win and needs to learn how to deal with adversity." Twenty-four hours after the Blackhawks debacle the Flames were back on the ice. They allowed 33 shots and lost again, this time in regulation, falling 2-1 to the Blue Jackets in Columbus. The big acquisition for the Edmonton Oilers this off-season was goalie Nikolai Khabibulin, the veteran brought in to stabilize a position that was erratic at best last season. The Oilers hope Khabibulin will pay big dividends if Edmonton can sneak into the playoffs. But between now and then, Edmonton has to win enough games to get there, and Khabibulin cannot do it alone. Khabibulin broke into the NHL in 1994-95 with the Winnipeg Jets. He played 72 games two years later with the relocated Phoenix Coyotes, plus another 70 games the following season. But he's 36 now, and he hasn't appeared in more than 60 games in a season since 2002-03 with Tampa Bay. So a crucial player as the Oilers try to reach the postseason will be backup goalie Jeff Deslauriers. In a 6-1 victory against Nashville on Monday, Deslauriers made his first start of the season. Never mind the lopsided score; Deslauriers was a major factor in the victory, stopping 39 of the 40 shots he faced. Look for Deslauriers to get the opportunity to contribute this season for new coach Pat Quinn that he didn't get under former coach Craig MacTavish. "That's what I want -- every goalie wants to have a big role on the team," Deslauriers told the Edmonton Sun. "Every year you have a different role on the team. Sometimes it's not the role you want, but you have to do it 100 percent. I know what to expect. It's hard to win games in the NHL. I won last year, so I can do it this year, too." Deslauriers was 4-3-0 with a 3.33 goals-against average last season. This season, he might appear in as many as 25 games, meaning the Oilers are planning on placing a lot of trust on his 25-year-old shoulders. "We're not playing him for any other reason than we think he can come in and give us good games," Quinn told the Sun. "We can't afford to have someone that our team can't feel the same way about. There's 40 points at least -- if he does play 20 -- that we're dealing with. We're not just throwing them away." 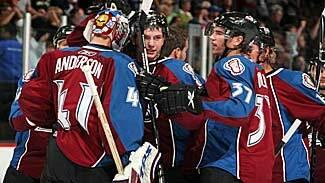 Surprise start -- Despite dire predictions, the Avalanche are off to a quick start. They skated into Boston on Monday night and knocked off the Bruins, 4-3. The following night, they routed the Maple Leafs in Toronto, improving to 4-1-1. It's a long way between now and April, when playoff spots will be doled out, but at least the Avalanche can dream. And a big part of the early success has been special teams, which were a big problem in 2008-09, when the Avalanche finished with the fewest points in the Western Conference. Last season, the Avalanche was 25th in the League on the power play at 15.7 percent, and 21st in penalty killing at 79.9 percent. Through the first six games this season, the Avalanche are 10-for-26, a 38.5-percent success rate. And the penalty killers have allowed only three goals in the first 24 shorthanded situations they've faced (87.5 percent). The penalty killing stuck the final dagger into the Bruins on Monday, when David Jones scored a shorthanded goal on a breakaway for a 4-2 Avalanche lead in the third period. When the game was over, Massachusetts native and rookie Avalanche coach Joe Sacco had gone into Boston and recorded his first road victory. "It's nice to have a win in your hometown, for sure, and it was a good win against what we feel is one of the best teams in the Eastern Conference," Sacco told the Denver Post. "We had a great start to the game. Our guys were really skating well. We talked about not standing around, not getting planted on the ice, and we used our speed at the start to get in on the forecheck and create a couple havoc goals." Sacco got his second road win the next night in Toronto, and Jones scored once again, though this time at even strength. Damaged Daniel -- The Canucks are off to a slow start, and making matters worse, they are going to be without Daniel Sedin for at least a month. Sedin was hit by a puck last week and X-rays revealed a broken left foot. Sedin, in his ninth season, was philosophical about the injury. "It's unfortunate, but I've been lucky so far," he told reporters. "I played a lot of games over nine years so it was bound to happen." It will be a strange sight to see Henrik Sedin playing in the coming weeks without his identical twin. Henrik has assisted on numerous goals by his brother, but will be separated from him for a while. "I'm hoping I can be very effective," Henrik said. "I think it's the same thing on any team if you have two good players that play a lot together: If one gets injured the other is affected for sure -- not because we're twins but because Danny is a good player." The Canucks had plenty of time this week to adjust. After beating the Stars in a shootout Sunday, they were off until Friday night's visit to face the division-rival Flames. Truly Wild -- It's going to take some time in Minnesota. 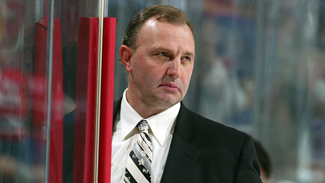 After spending their entire history constricted by coach Jacques Lemaire's defensive style, the Wild has switched under Todd Richards to a more offensive style. Certainly, it's got the potential to be more aesthetically pleasing. But the results may not be there for a while. Saturday at San Jose, the Wild unveiled its new style and were all over the Sharks at the beginning of the game. They had a 26-13 advantage in shots on goal and a 2-0 lead, but they couldn't maintain their edge for the full 60 minutes against the high-powered Sharks and wound up on the short end of a 4-2 score. Two nights earlier, the Wild were blown out in Los Angeles and Richards actually benched two of his best offensive players, Martin Havlat and Petr Sykora, for part of the night. "It's going to come down to accountability now," Richards told the Minneapolis Star Tribune. "I think we've given the guys the benefit of the doubt more times than not and now it's going to come down to holding guys accountable. It might be losing some ice time or being taken out in different roles. But we're going to get better. I know that for a fact." It's going to take a while. Installing a new system always does. No matter how dedicated the players are to learning that new style, mistakes are inevitable. "The guys, you talk with them after the game, you talk with them today, they have a tremendous amount of pride," Richards told the Star Tribune. "They know what they're doing wrong. It's just getting everybody on the same page. I know I've said that a lot. And it's going to be a little bit of the growing pains. "I'm still dealing with a lot of the same mentalities that have been here in the past years, so it's still fighting through all of that." The Wild fell to 1-4-0 Wednesday night with a 3-2 loss at Anaheim.